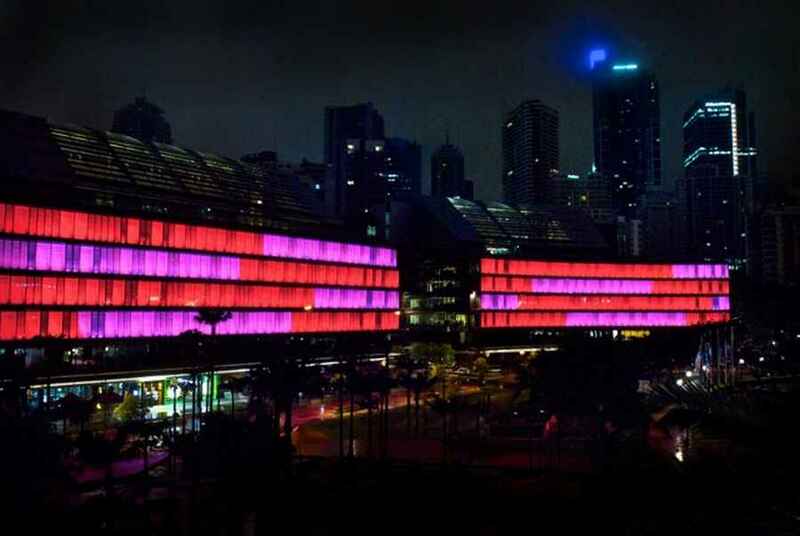 Klik Systems are delighted to announce their involvement in ‘Luminous’, the world’s largest interactive light installations, officially opening today in the new Darling Quarter precinct in Sydney’s Central Business District (CBD). The new precinct has ambitions to become Sydney’s most loved community hub, and the large new digital art canvas has been manufactured by Klik Systems using advanced LED systems. The new Luminous at Darling Quarter will be a permanent platform solely for illuminated digital art – both animated and still. The ‘canvas’ extends over four levels of two campus-style buildings, covering 557 windows in total, and presenting a radiant digital façade spanning a distance of 150 metres. “We’re delighted to be expanding our portfolio to include art projects such as Luminous,” said Klik System’s International Sales & Marketing Manager, Cliff Hadley. “We’re thrilled to be participate in Sydney’s ambitious public art programme, and particularly committed to art where light is the medium,” he said. Active from 19.30 daily, from Friday through Sunday interactive consoles in the park will allow the public to ‘make like David Hockney’ and paint their own digital designs on the buildings. Web surfers can also participate via phone app or computer through a dedicated website at My Interactive City. A 5-minute time-lapse allows for editing in case of malevolence. The interactive component of Darling Quarter is unique in the world. 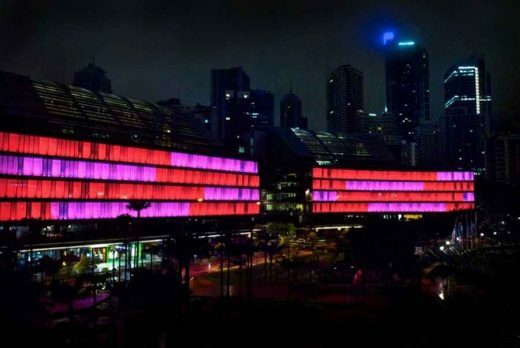 “The digital façade allows guests to engage with the precinct both locally and remotely,” said David Rolls, MD of Lend Lease’s urban development business in Australia. “Visitors can be part of the digital façade lighting experience for free,” he said. Lend Lease designed and constructed Darling Quarter for owner APF Commercial, and first proposed the idea of a permanent space for illuminated art there. Darling Quarter precinct includes a community green, children’s playground, and a large number of world-food restaurants, cafes and bars, and reflects Lend Lease’s enthusiasm for iconic new spaces for future generations. On the Darling Quarter digital facade, each window of the buildings forms a ‘pixel’ in the canvas, lit with Klik Systems’ energy efficient LEDs, and seen from a distance they can form a coherent animated picture, should the artist want that effect. A sophisticated colour palette is available, thanks to a white chip added to the usual RGB colours. Timber louver blinds across the 555 windows provide a solid background, and Klik’s linear LEDs running along the windowsills have been angled upwards with a 10-degree spreader lens, designed to create an indirect light source on the back surface of the blinds. The site called for a design small enough to meet the brief but large enough to house the control equipment. “We beat an international field of competitors to win the contract, because we were the only company able to build and produce a fitting this small. Everything had to be fully customised,” says Cliff Hadley at Klik. The digital façade will be in action six evenings a week. On Tuesdays, Wednesdays and Thursdays, it will display ‘soft’ images such as clouds or waves. On Friday, Saturday and Sunday the Project comes into its own, displaying artworks that invite debate and make art critics – and artist – of every citizen and visitor. Transformation of the Darling Island public areas. Darling Island Apartments, originally completed in 2004, is one of the most prestigious developments in Sydney in recent years. Located on a virtual island at the western side of Darling Harbour, it has spectacular Sydney city views and absolute water frontage. The large apartments are luxuriously and environmentally designed.